Romans 1:18-24 (KJV) "For the wrath of God is revealed from heaven against all ungodliness and unrighteousness of men, who hold the truth in unrighteousness; because that which may be known of God is manifest in them; for God hath shewed it unto them. For the invisible things of him from the creation of the world are clearly seen, being understood by the things that are made, even his eternal power, and Godhead; so that they are without excuse; because that, when they knew God, they glorified him not as God, but became vain in their imaginations, and their foolish heat was darkened. Professing themselves to be wise, they became fools, and changed the glory of the incorruptible God into an image made like corruptible man, and to birds, and four footed beasts, and creeping things. Wherefore God also gave them up to uncleanness through the lusts of their own hearts, to dishonor their own bodies between themselves: Who changed the truth of God into a lie, and worshiped and served the creature more than the Creator,For this reason God gave them up unto vile affections...men leaving the natural affections of women burned in their lust toward one another...being filled with all unrighteousness...backbiters, haters of God, despiteful... without understanding..who knowing the judgment of God, that they which commit such things are worthy of death, not only do the same, but have pleasure in them that do." Images of Creation and "Evolution of Man" public domain-over 100 years old. 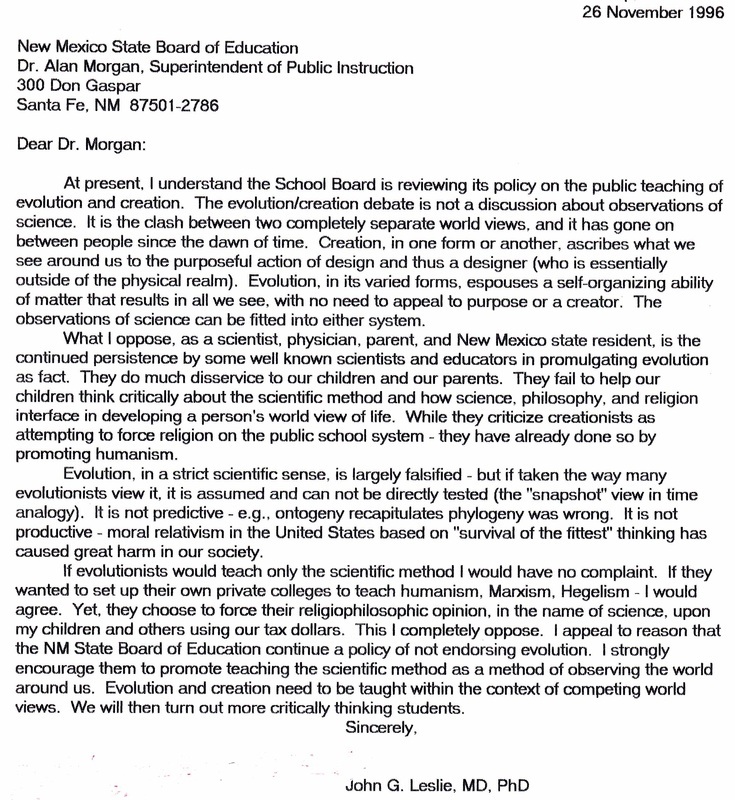 The impact of rote teaching evolution to virtually all students in the United States and even worldwide has had a profound impact in hindering them from thinking critically in the areas of science; as well as philosophy and religion. This section addresses issues in science education. Several of the letters below are more than one page in length. I believe there are strict scientific, philosophical, and religious reasons to not adhere to evolution. Design evokes a designer/creator. Nature and the observations of science support this concept. There are definable, reproducible phenomenon in nature (i.e. the law of gravity). Common design principles are seen among various life forms, e.g. light receptor systems, smell, locomotion, energy transformation, waste production, flight, and others. A common genetic code contains these details. Analogy has been made of the factory with the functions of the cell. The eye is compared to the camera, the digestive system with a fuel burning engine, eighth cranial nerve vestibular function with that of a gyroscope, etc. Nature abounds and attests of common design features - both within the organic and inorganic world. Man only utilizes design features already present in the natural world. Contrary to what some scientists believe, there is little evidence to support a non-designed, mechanistic development (evolution) of life from non-life. Numerous studies have shown that life could not have developed from simple organic molecules on our present earth. Some have devised convoluted arguments as to how life began on another planet and was somehow transferred here (via comet, etc. ), yet absolutely no substantial evidence exists for organic extraterrestrial life. The concept of natural or artificial selection does not support evolution or transmutation from simple to complex life forms. It is even questionable whether there is such a thing as a simple life form. Regardless, many evolutionists believe that the mechanism of selective pressure on mutational alterations has resulted in this supposed progression. In contradiction, enhancing the mutation rates among fruit flies has done much to help in the understanding of individual gene function, but has scant effect in changing fruit flies into other organisms. In fact, just the opposite occurs. A fly with double the set of wings can't fly whereas the normal one can. An antenna in place of the eye is debilitating. The concept of gene mutational load and the necessity of DNA repair mechanisms argue against the usefulness of mutations. Natural selection does occur however. Debilitated animals are removed from the herd by predators, or die from organic diseases. But this serves to preserve or even cleanse the gene pool from some of the effects of mutations. Thus, there is little empirical evidence that it forms the basis of trans-mutational (i.e. reptile to bird) change. In addition, most so-called vestigial organs have been shown to have a functional purpose - as knowledge has advanced, e.g., tonsils, appendix. Some will say that the fossil record reveals the evidence for transmutation. Yet, certain non-empirical and preconceived ideas must be accepted concerning the record. I, for one, do not accept that the record was the product of slow accumulation of layer upon layer of sedimentary soil, with life forms occasionally trapped in it. There is much evidence for catastrophic deposition. Present conditions do not support the preservation of numerous whole large animals by simply dying and settling in the ooze. Yet, catastrophic preservation of intact animals and humans has been shown at Pompeii. As well, because animal and plant life lie together in a given strata, it does not follow that they necessarily lived together; but only that they may have been buried together. Even when one accepts some sort of slow progressive sedimentary buildup, there is not gradual transition from one life form to another. Because of this, and the absolute commitment to trans-mutational change, some have devised the concept of punctuated equilibrium, which surmises that the transition occurred rapidly in small numbers not allowing for preservation of sufficient numbers of organisms. Thus, it is a non-verifiable idea to explain why there is no evidence for transitional life forms. Using this concept some have propounded upward, sidewards, and downwards evolution. It may be a philosophy or paradigm, but it is not a working hypothesis, because it cannot be tested for falsity. One might ask why when the observations of science cry out for design and a designer, do some scientists cling to a mechanistic (non-purposeful, non-designed) view of the universe. The reasons are probably as varied as the individuals involved. Many choose to believe in evolution because it allows them to dictate their own views of right and wrong. Unfortunately when whole societies have believed this it has led to anarchy. The so called battle between science and religion is really a battle of world views: the mechanistic view of life verses a creation view of life. Nonetheless, I do believe the concepts and observations of science better support design and thus a designer/creator. For the above reasons and many others, I believe in God and not evolution. "﻿BioLogos is a leading voice for ‘theistic evolution’﻿, though not all theistic evolutionists	would agree with BioLogos at every point. BioLogos teaches that	people do not all originate with Adam and Eve but that, “humans descended	from a group of several thousand individuals who lived about 150,000 years ago.”...The author of the article then commented, "If Adam’s one sin didn’t lead to condemnation for all men,	then why should anyone believe Jesus Christ’s one act of righteousness will	lead to justification for all men (﻿﻿﻿﻿Rom. 5:18﻿﻿﻿﻿)?...The origins debate is not the Bible vs science; it is biblical history	vs extra-biblical history. Leading evolutionary scientists are not wrong about science;	they are wrong about history. Dr Collins, BioLogos and other evolutionists	take today’s discoveries and interpret them to fit with evolutionary	history—a history that they accept by faith."... See link below for complete article. by Harry Cook August 2, 2013 — "As people of faith, how are we to understand the topic of biological evolution? This topic has been raised in the pages of The Banner and elsewhere in Reformed circles. As Edwin Walhout suggests in ﻿his article “Tomorrow’s Theology﻿” (June 2013), there is convincing evidence to support the thesis that biological evolution has occurred. At the same time, we need to acknowledge that opinions on the topic vary widely, as indicated by the responses to that article. I believe more needs to be said. So in the spirit of engaging the church in an open and continuing conversation, here are some suggestions for broadening the discussion." "Many Christian biologists—and I include myself in this group—accept the findings of biological science as a feature of creation that we have to account for. The combined evidence from fossils and from scientific comparisons of the anatomy, physiology, and DNA of various organisms is so strong that it can no longer be ignored. As a result, most Christian biologists I know accept some form of evolutionary development." I live in New Mexico and among a fairly large group of Christian Reform Believers in a small community. The CRC has a high school here as part of an outreach to the Native American community. I myself work at the Indian Health Service and have done so for 20 years. I am a born again conservative Christian, for 38 years. I am writing because a good friend, a teacher and a CRC church member, has given me the Banner magazine for September 2013. It has a lead article entitled "God's Plan for Creation: Biological Evolution Revisited." It made me weep. I have known for years the CRC position on the Creation/Evolution debate but it is a wrong position. Why I say this is that every evidence used to support "macro-evolution" is an extrapolation of the obvious variation that occurs in animal kinds. This is not the kind of change required by the microbes to man belief. But why is this important? Because by it secular man can use it, evolution, as an excuse to exclude God thus nullify or dull evangelistic efforts to reach them. For Christians it makes God out to be a harsh and detached Being. He becomes "nature red in tooth and claw", and He is portrayed as supporting the strong and aggressive rather than the weak and mild. The Righteousness and Holiness and Love of God becomes garbled. 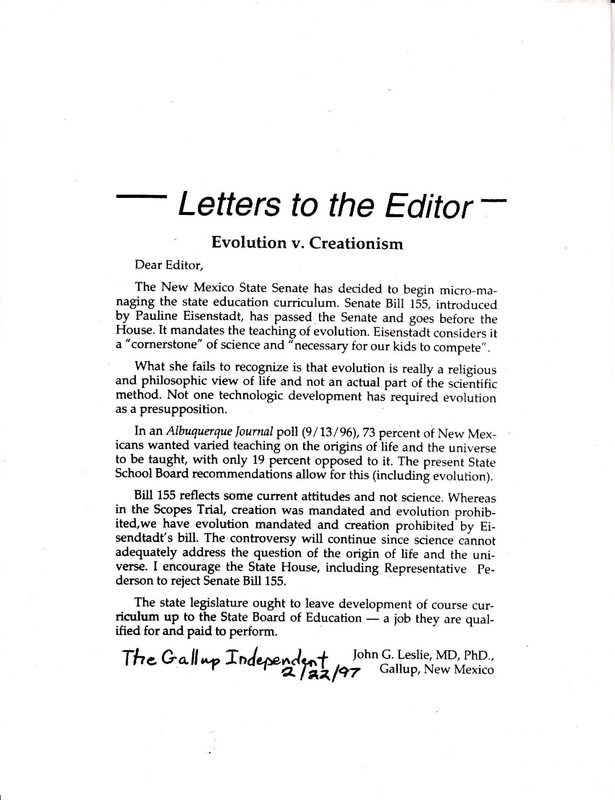 There is so much that can be said against the concepts of evolution at every level of debate: Science, Philosophy, And Religion but I am not trying to address that in this letter. I do have a website that you could look at: ﻿www.DefendingtheChristianFaith.org﻿. and there are many much larger sites on the internet including: Creation Ministries International and the Institute for Creation Research. Thank you for the nicely produced magazine and for your overall emphasis of encouraging the body of Christ. The Creation Story for Atheists (New Oxford Review March 2011 and my response below) See link below response for access to article. "John Leslie PhD, MD, PhD, a creationist biologist and biblical historian who wrote some articles for Creation and Journal of Creation in their ‘early days’ writes in response to article: Can evolution and religion co-exist? The battle remains as to who has the real worldview. John G Leslie PhD, MD, PhD "
Comments from "Knowing God Made Nature" 1-13-13 Creation Ministries International online 2-2014. See link below. The link below is to an online book put out by Creation Ministries International titled "The Creation Answers Book". There are 20 Chapters. Titles to some are: Does God Exist? ; Six Days? Really? ; What About Gap Theories? ; What About Carbon Dating? ; How Can We See Stars in a Young Universe? Was the Flood Global? etc.